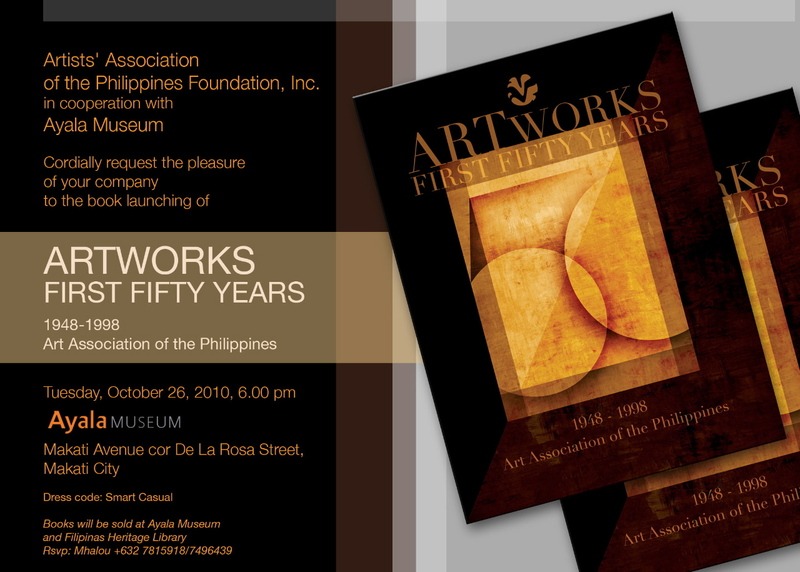 The Intersections & Beyond: AAPFI & Ayala Museum launch the book, "Artworks: First Fifty Years (1948-1998) of Art Association of the Philippines"
AAPFI & Ayala Museum launch the book, "Artworks: First Fifty Years (1948-1998) of Art Association of the Philippines"
Artists' Association of the Philippines Foundation, Inc., in cooperation with the Ayala Museum, launched the book, Artworks: First Fifty Years (1948-1998) of Art Association of the Philippines on October 26, 2010 at the Ayala Museum in Makati City. This is another breakthrough in the history of Philippine Art, marking the best works that span for 50 long years. We can see here names of artists that have remained in perfecting their craft, including those that still continue to be an influence and inspiration to the younger generation. Books will be sold at Ayala Museum and Filipinas Heritage Library. For more info, please contact: Mhalou (632) 7815918 / 7496439.